Upgrade the handling performance of your Mustang with High-Performance 4.5-Leaf Rear Springs (175lb). 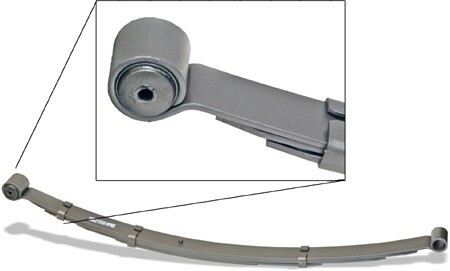 Mid-eye spring lowers your car approximately 1" from the stock height. Offers superior road handling over stock, 4-Leaf designs. These springs also help prevent wheel hop and spring wrap up on hard acceleration. Our springs are the only ones on the market painted steel-gray to closer resemble OEM appearance, and to provide a nice contrast compared to traditional black replacements. Sold individually. You will need 2 per car.